There are currently 10,581 Automatic Firmware Update Apps installed on Xerox multifunction printers with 135,701 successful downloads! These automatic software updates decrease service & support calls, increase network security, increase equipment compatibility and increase equipment reliability! Studies show 35% of service calls for a Xerox multifunction printer involve a firmware update to resolve. Currently 160 Xerox partners are installing the app on their customers’ devices. With all copier manufacturers, firmware (or systems software) for copiers & multifunction printers has traditionally been installed manually at the device. Updates are released on a regular basis and are required to fix operational issues, correct new compatibility issues, add new features and apply security patches. This time consuming task decreases productivity. There are several tools that decrease the time that is taken to upgrade firmware on multiple devices but these tools still contain multiple steps that must be repeated on an ongoing basis. 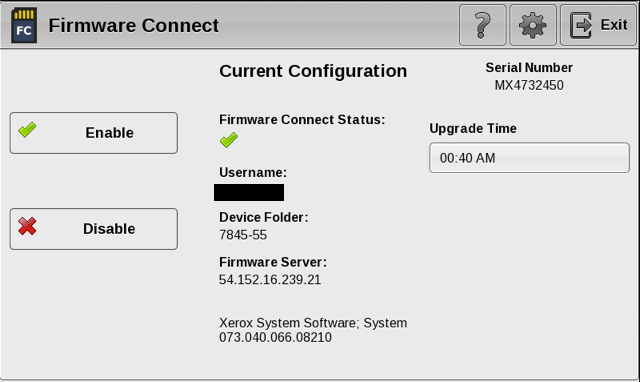 Once installed, the Automatic Firmware Updates App solution automatically brings the Xerox multifunction printer to the most recently approved version of firmware sequentially with no intervention from the partner. Updates are performed at night or during non-business hours to avoid interruption. The Automatic Firmware Updates App Solution for Xerox multifunction printers increases customer satisfaction, increases equipment reliability, increases equipment & network security, decreases service calls and decreases the time that is required to perform these updates manually. Southern Solutions is the leading provider of applications for Xerox ConnectKey multifunction printers and the first certified Xerox Personalized Application Builder in the U.S. With our App Solutions, we create custom apps for Xerox multifunction copiers that increase efficiency and improve workflows. Our apps are installed on thousands of Xerox devices across the globe.